This article is part of a series entitled “Ubuntu Beginners”, which which walks new users through basic Desktop and Command Line usage. 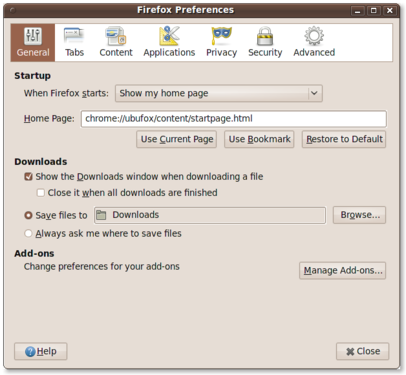 This article will detail how to change the default Firefox home page. As outlined in a previous post: Ubuntu 10.04 to Change Default Search Provider, the default search provider (and home page) in Ubuntu 10.04 will be changing from Google to Yahoo!. This article will outline how to revert that change, or define an alternate preferred search provider. 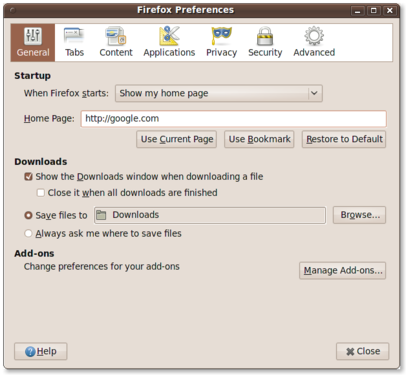 This will open the Firefox Preferences utility, which allows you to customize a wide range of Firefox settings. The primary setting that we’re looking for is the Home Page. 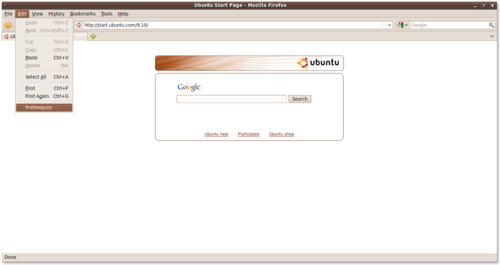 In the default installation in Ubuntu 9.10, the Home Page is set to: chrome://ubufox/content/startpage.html. In future versions the Home Page will be set to Yahoo!. To update your Home Page, simply change the URL defined. The second screenshot below demonstrates defining Google as the preferred Home Page. The change is minor between the two screenshots, but it does make a big difference. A users Home Page is the launching point for all Internet activity. It can allow you to quickly access your favorites sites, or provide you with tools you need. The change from Google to Yahoo! has been a controversial one, but one of the main benefits of Open Source Software is the ability to choose and customize. Changing your default Home Page and Search Provider simple. There is an even easier way, instead of opening preferences, drag the icon beside the url to the home icon and it will prompt you if you want to change your homepage. Thank you so much ………….I was searching under tools menu> options…. as in windows…….thank u once again…………..